57.1 percent had no home equity. 20.4 percent had no home equity. Financial assets included in the study (detailed in the pie charts below) were held in IRAs, Keoghs, 401(k) plans, investments, and bank accounts. Social Security and income from traditional defined-benefit pensions were excluded here, though the paper tabulates that too. These findings “raise fundamental questions about the health of the US retirement savings system,” said Harvard economist David Laibson, in a published comment on their paper. Laibson isn’t optimistic about the financial prospects for retirement among younger Americans either. It doesn’t have to be all gloom. It’s possible some people have been extremely accurate in estimating their financial needs in retirement – virtually down to the last penny. Or perhaps some may have given almost everything away in time to avoid estate taxes. 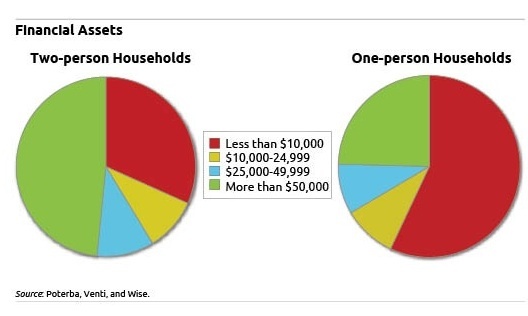 Indeed, the well-off also shine through in these data, which show that nearly half of two-person households have more than $50,000 left – this can mean millions of dollars for a small minority of them. But a frightening share of the elderly seems to run out of money, and plausible explanations run the gamut. They may have started with few financial assets as they entered retirement, a well-documented problem. Inadequate retirement income from employer pensions or Social Security is another reason to deplete assets rapidly. And a mere $10,000 in the bank at the end of one’s life provides no clues as to how many corners were cut during years, even decades, of retirement. Daily living expenses do tend to decline as one ages: income taxes are lower for most retired people, as are commuting and work expenses like pricey business suits. “A lot of the discussion of changes in expenses has focused on what happened in the early years,” Poterba said. But he noted that late-life expenses can be steep, ranging from installing a wheelchair-accessible walkway at home to paying full freight for a nursing home. By one estimate, $250,000 in retirement savings is the minimum required if nursing-home costs are included in retirement expenses. Yes, many people are underfunded; yes, more people have more than enough during their lives and for their heirs. Review the annual EBRI survey and its summary. The summary is just as disenchanting; The data themselves show quite a different story or wealth spread across the spectrum of retirees. If retired people did not face the threat of their savings being decimated by health care costs, they would stand a much better chance of passing away with dignity. Shame on our poorly constructed, and politically warped, U.S. health care system. One thing that this study does not take into account is the propensity for individuals with high five-figure and low six-figure asset accumulations to spend down and qualify for Medicaid. There is a whole subset of lawyers who specialize in this area of the law. I have prepared tax returns for individuals for 42 years; as my clientele ages, I have watched assets just disappear from their accounts, homes sold with no sign of the proceeds, and homes turned over to children. Some people expect the government to take care of them in their old age, even if they have assets. One should also consider the data on Social Security and income from traditional defined-benefit pensions (excluded here, though the paper tabulates that too). Having a reliable income mitigates having little other net wealth. Of course, the next generation of retirees will have a lower percentage of income from traditional pensions. The study does not account for the significant number of middle class elderly who intentionally impoverish themselves by giving their remaining assets to their children well before they die. They do this to qualify for Medicaid nursing home benefits. Using this approach, they can provide a legacy for those they love while the government picks up the tab for their end of life care. How much these elderly had in their last years of life has no relationship to how financially prepared they were when they retired. This brings up the question: How Rich Should You Be When You Die? Perhaps these quotations about money that come from the book, “The 777 Best Things Ever Said about Money,” will put things in proper perspective. This study is disturbing no matter how you read it. The last paragraph is the most important. The reason for the low balances are beyond the scope of the new research. That, Poterba said, “needs to be investigated.” I look forward to the sequel. We can barely afford medical services, much less expect the “politically-warped U.S. health care system,” to pay for long-term care expenses. A better question is why aren’t more people prepared financially to support themselves in retirement?